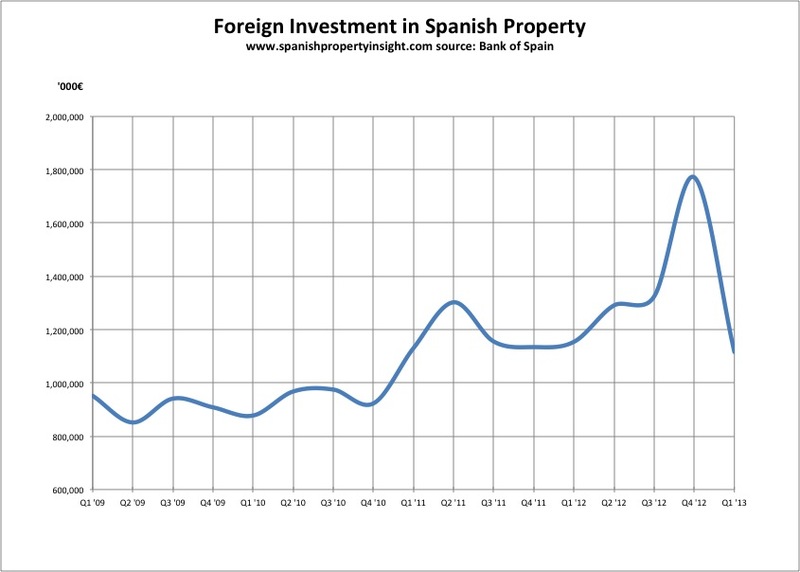 After piling into Spanish property last year, foreign investors took a breather in the first quarter of the year, according to figures from the Bank of Spain (illustrated by chart above). Foreigners invested 1.116 billion Euros in the first three months of this year, 37pc less than in Q4 of 2012, but a less alarming -3pc down on an annualised basis. The Bank of Spain’s figures include investment in all types of real estate – residential, commercial, and industrial – by both retail and institutional investors. 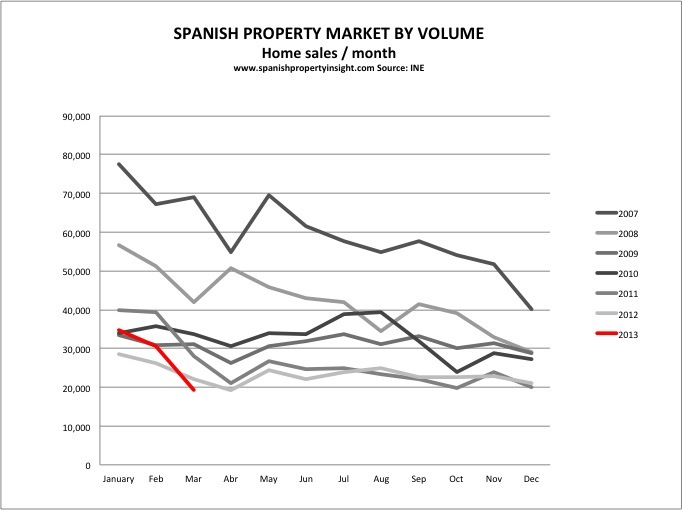 Foreign investment in Spanish real estate typically increases towards the end of the year as deals are closed, and then falls off in the first quarter of the year, though never before by this much. Robust growth in foreign investment in real estate was one of the few bright spots in the Spanish economy last year, with investment growing every quarter, and surging 56pc in the last 3 months of last year to 1.771 billion Euros. Foreign investors were not the only ones to slam on the breaks in the first quarter of the year. Local investment also slumped in Q1, as illustrated by the chart below. Various factors lie behind the declines in both local and foreign investment, but the end of tax breaks and the rise in VAT on new property sales probably played the biggest role by bringing forward sales into Q4 last year. The introduction of the Sareb (the so-called bad bank) at the start of this year has also slowed down sales. Unless there is something more serious afoot, foreign investment should recover some lost ground in the year ahead. Too early to call. We will have to see what happens in the next few quarters.